How Do You Simplify the Square Root of a Negative Number? Simplifying the square root of a negative number is very similar to simplifying the square root of a positive number. You just need to remember 'i' in your answer! 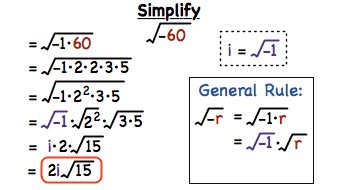 Check out this tutorial to see how to simplify the square root of a negative number. How Do You Find the Prime Factorization of a Number Using a Tree? To write the prime factorization for a number, it's often useful to use something called a factor tree. Follow along with this tutorial and see how to use a factor tree to find the prime factorization of a given number. How Do You Use the Square Root Method to Solve a Quadratic Equation with Imaginary Solutions if a≠1? The solution to a quadratic equation can sometimes be an imaginary number! This tutorial shows you how to use the square root method to solve a quadratic equation that has imaginary solutions.